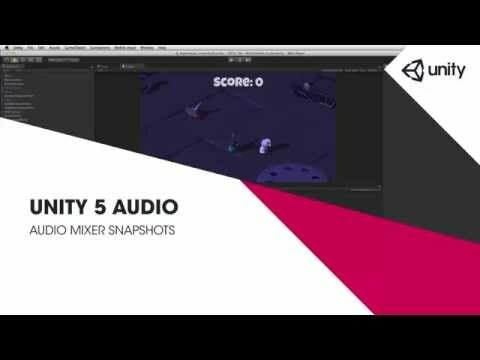 In Unity it's possible to store and recall the state of an AudioMixer including volumes and effect settings using Snapshots. Snapshots can be recalled via script using the TransitionTo or the TransitionToSnapshots functions. we have two snapshots created. In this case Unpaused and Paused. in this case to 22000hz. which is running through the music group of master mixer. the music track will be low pass filtered. is low pass filtered and when we press again. the + button in the snapshots area. by clicking on the snapshot names. between one snapshot and another. Let's take a look at Pause Manager in mono develop. to our canvas component using GetComponent. or Disabled if it's enabled. We'll also call the Pause function. And if it's not we're going to set it to 0. If it is we'll set it to 1. Next we're going to call the low pass function. meaning it's going to stop playing our scene. quit the application out to the desktop. the default interpolation curve is linear. will give us an S shaped transition curve. Squared will give us a parabolic curve. Square root will give us a square root curve. to at the beginning of the transition. make a hard transition to the stored value. Transition to snapshots function takes 3 parameters. we want to create a blend between. Second parameter is an array of floats. of each element in the resulting blend. the time to reach the new desired blend. What we've got here is we've setup 3 cube triggers. in our sound effects sub mixer. group of our master mixer. I've turned down the music for this example. we've added a send effect. that we've added to reverb return. to sound like they're happening in a reverberant space. is turned all the way down. and we can just listen to how those sound. Click, we can hear no reverb. reverb on there so that we can hear the effect clearly. transparent cubes called reverb trigger 1, 2 and 3.
reverb control, which takes an integer trigger number. which has that script attached to it. to each of these trigger objects. the namespace declaration using UnityEngine.Audio. and audio mixer snapshot classes. as we blend between our different snapshot states. which takes a parameter of the type int called TriggerNr. reverb trigger script when the player collides with the collier. case 1, case 2 and case 3.
snapshot we want to contribute to the blend. the right-most red trigger collider. and 0% of the snapshot at 1 in the snapshots array. snapshot and 100% of our heavy reverb snapshot. and 75% of our heavy reverb snapshot. to our mixer variable slot. by clicking and selecting them from the list. and here we have our heavy reverbs snapshot. lists of elements can line up. those are going to be set by the script at run time. triggers, let's give it a try. represented by the purple collider. and recalled using this same technique.